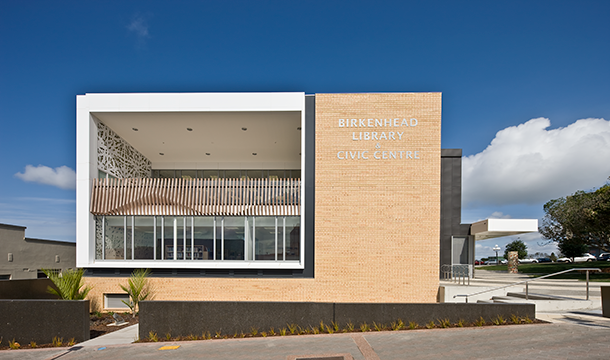 The contemporary Birkenhead Library and Civic Centre building is 2,600m² in size situated on a 3,415m² site and incorporates library operations, archives, public toilets, meeting and community rooms, Citizens’ Advice Bureau, Plunket and community services. As with all local government projects, ensuring that the project was completed within a conservative and realistic budget was paramount. To achieve the best value for money, detailed cost modelling and value management exercises were undertaken at the outset of the project, including benchmarking against similar projects in New Zealand and internationally. The building is founded on large in situ concrete pads and tie beams. Due to the sloping nature of the site, previous excavations and a high water table, the foundations were constructed under the strict guidance and supervision of the geotechnical engineer. The structural elements are simple, and their materials easily procured, making the construction activity seamless. The inclusion of secondary structural members into the structure for façade connections presented a challenge but was well resolved through the shop drawing process using specialist expertise. An admirable 94% of all waste material from the site during construction was recycled. This is attributed to well-managed material orders, the contractor and subcontractors working very cleanly, minimising wastage and numerous building elements being fabricated off-site. The building’s detail strikes a balance of decorative and practical. Laminated Purple Heart and Alaskan Yellow Cedar “fins” have been used to screen the west façade, mezzanine and exterior deck. 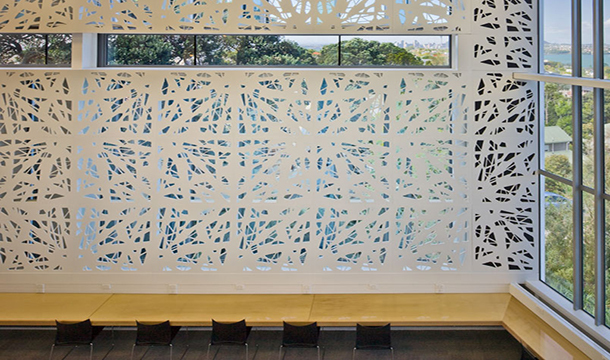 These add sculptural interest when viewed from outside and act as sun control or compliant barriers. 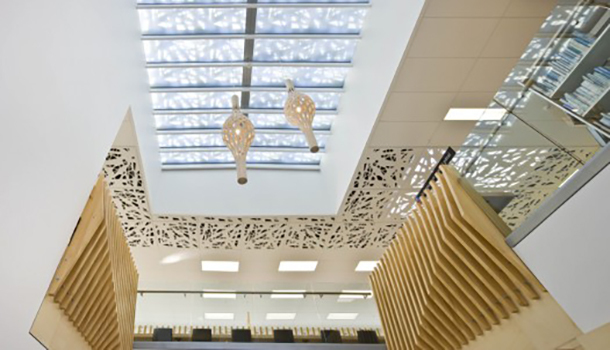 Laser cut painted sheets form an internal perforated screen to the south façade, while laser cut perforated ceiling panels dapple light from roof lights, supplying smoke extractor fans. 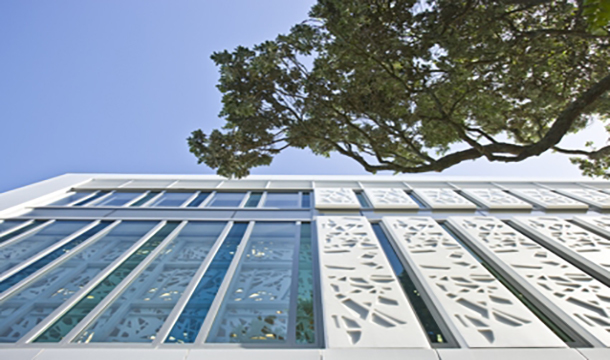 Precast patterned lightweight panels to the south façade continue the sense of lightness and transparency. Using lightweight concrete reduced the level of additional insulation required. 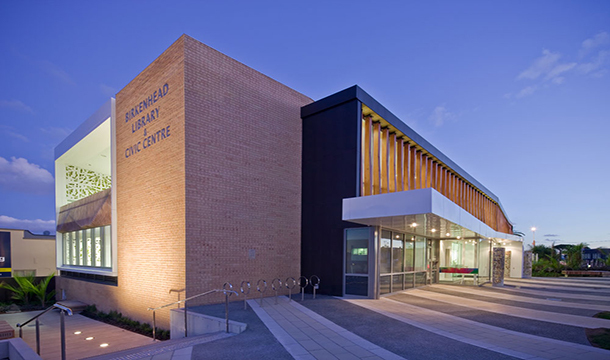 The then North Shore City Council expected that the Birkenhead Library and Civic Centre capital/operational expenditure benefits would accrue from the overall investment of $9.85 million. The development makes a noticeably positive contribution to Birkenhead’s built and cultural environment, becoming a local landmark and community hub. “Throughout the project the RDT Pacific project management team has worked professionally and effectively. RDT Project managers worked with all members of the project team to keep the projection on time and within budget. RDT Pacific made a major contribution to the successful completion of an important community asset”.